All business is about growth. For small businesses this is doubly true. Regardless of the industry, the best way to go about growing your business is to expose it a wider audience. In this day and age that means a good online presence can make or break you – if you can’t be found on Google and other major search engines, you’ll have a much harder time. Selling online can take your business to a whole new level by expanding your customer base beyond your local area, but not all businesses are a good fit for e-commerce. How do you know if you should start selling online? How can you handle the logistics of delivering your products or services cost-effectively and maintaining good customer service from a distance? 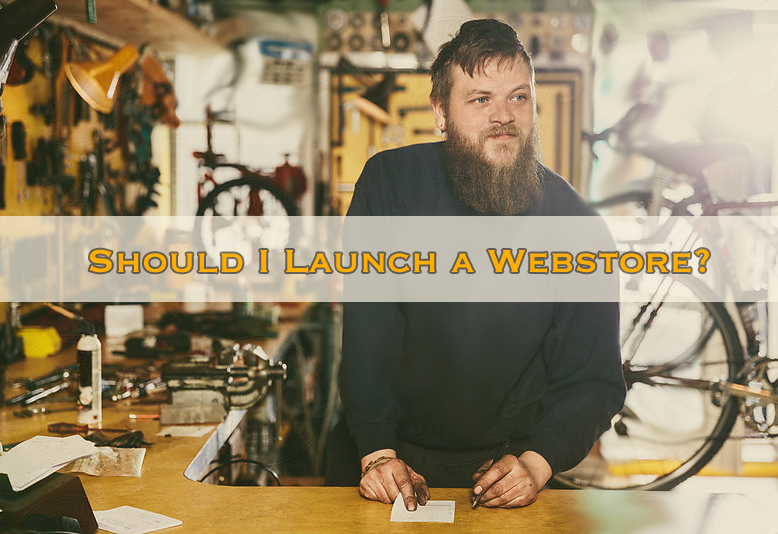 Small business owners usually have a never ending to-do list, so it’s no surprise if you haven’t gotten around to launching a web store yet. Before taking your business online, the first thing to ask yourself is whether you have the ime and resources to create and maintain an online store. If you’re running a successful business you probably have a positive relationship with your customers, and you wouldn’t want to sacrifice maintaining that relationship by putting all your time into another project. You also need to ask yourself if your customers and people like them could benefit from an online store for your products. This will depend on several factors, including what type of goods or services you sell and where you’re located. Will you be able to deliver your wares realistically and cost-effectively? Very small, cheap products may not be worth selling online except in bulk, while large products may be difficult to ship. To deal with large items, you could offer your shoppers an in-store pickup option, or see if your suppliers are willing to ship them directly from their warehouse to your customers (drop-shipping). Depending on what you sell, your location could be the factor separates a successful web store from one that just makes ends meet. For example, nearly half of the web stores started in the Netherlands in 2012 have already shut down. Knowing your target market’s online spending habits and preferred payment methods will help you determine where your fashion or home & garden web store will be more likely to succeed. The size of your social media following: If you already have a significant social media following, then you can direct that audience to your web store instantly and start seeing a return very quickly. The amount of non-local website traffic you receive: If your website receives a significant amount of visitors from outside your city or region, adding a web store has the potential of converting this traffic into new customers. Your brand awareness level: If your brand is already well-known and publicly recognised, then shoppers are more likely to seek out your web store on their own. More potential customers: Launching a website opens your business up to a much larger base of potential customers. Where once your sales were restricted to your local area, now you could in theory sell to anyone, all around the globe. Longer operating house: You can also sell around the clock – since your e-commerce sales are automated you could be earning money even when you brick-and-mortar store is closed. Lower overhead costs: Selling online also comes with much lower overhead costs compared to in-store. Your rent, utilities and taxes are all significantly reduced, as are the costs associated with having to staff your brick-and-mortar location. Less inventory requirements: If the manufacturer is willing to drop-ship, meaning to ship items directly from the warehouse to the purchaser, you can cut down on your inventory costs. Customer service: Customer service becomes an entirely different thing for online shoppers. You can’t build a personal relationship with your customers the same way as in your brick-and-mortar store, so maintaining a good CS presence is very important. Customer impatience: Online shoppers are accustomed to one-click shopping, so you need to make the customer experience on your web store as smooth and straightforward as possible. Increased competition: E-commerce is also a very competitive industry. While your brick-and-mortar store competes regionally, your web store will need to compete globally. Standing out from the crowd can be a real challenge when there are hundreds of thousands of other online stores within reach of anyone with access to the internet. Technical issues: You also need to learn how to deal with an entirely different set of technical problems involved in running a store entirely online. If you website or e-commerce processor goes down, you can quickly lose a lot of money and a lot of customers. But don’t let that deter you. DalPay’s mission is to work with you to ensure that all your e-commerce needs are being met and that you can take advantage of one of the most reliable payment platforms in the business. And once you get past the initial investment of launching an e-commerce operation, there is only growth ahead. Web stores are extremely scalable, so while your brick-and-mortar location may be limited by the size of a building, your online sales can keep on growing. Stay tuned to the DalPay Blog for new, vital information and statistics on e-commerce activities and trends in specific markets, including which industries are growing and what’s selling where, in our Industry News & Tips.